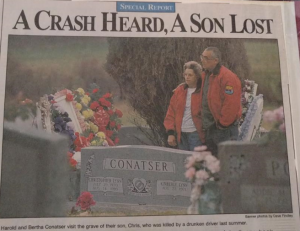 Chris Conatser was a remarkable young man. He was so giving and unselfish that he often put others first. He would literally give his last dollar to another in need. (His sister, Aline Skelley, says she knows this to be true because there were times he had to ask his dad for lunch money because of it!) But it wasn’t just money. He was sacrificial with his time as well. He adored his Uncle Junior so much – Junior was suffering from end-stage renal disease – that he had spent time training in ambulatory dialysis so he could help Junior with the treatments he needed three times per week. Chris didn’t have a lot of time for himself as it was. He worked six days per week at Fast Food Merchandising where he was tow motor operator. One of his coworkers was Joe Breeding, whose wife was in a wheelchair. Whenever Joe needed to take time off to take her to the doctor in Nashville, almost two hours away, Chris would tell Joe to take his truck. “You can put her wheelchair in the back of the truck,” he would say. Joe was shocked that Chris would make such a gesture as to offer his vehicle to someone he only knew through work! But that’s the kind of guy Chris was. He enjoyed the little things in life. When he could, he loved being on the lake and reading, and he also loved his his grown-up toys: his truck and his motorcycle. He had been married to his wife, Kim, for just over a year and dreamed of a family in the future. 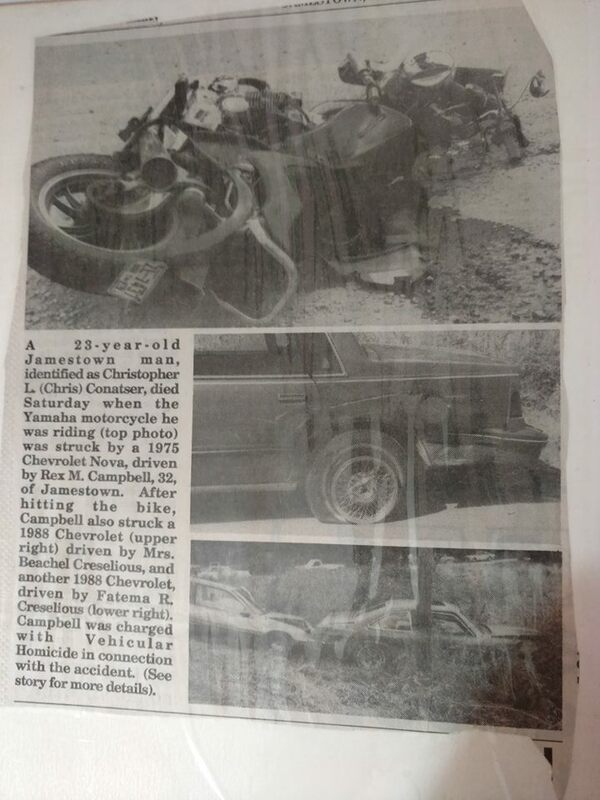 On August 14, 1993, at 3pm, Chris was on his way home from getting a haircut, riding his motorcycle. He was less than 1/4 mile away, when a repeat offender with a .25 BAC ran a stop sign, crashed into Chris, and continued through the intersection hitting two other cars. The drunk driver, got out of his car and started to walk away, leaving Chris bleeding on the street, before witnesses stopped him. Chris was airlifted to the University of Tennessee Medical Center in Knoxville. Norris drove to the hospital. But when she got there it was worse than expected. The hospital staff told her that her brother had “expired.” (She says she still hates that word to this day…it sounded so cold, so casual, so final.) Chris had died on the helicopter en route to the hospital. He had turned 23 years-old just two weeks before. Aline’s family was nowhere to be found. They had already left the hospital. (It was in the days before cell phones, so no one was able to call her.) Norris and Aline started the hour and a half drive back. Aline says it felt like an eternity. None of it seemed real. No one at the hospital had asked if she would like to see Chris and she didn’t think to ask herself. She says, “I was moving in a fog, going through the motions.” She desperately wanted to be with her parents, her other brother, and her sisters. When they finally pulled into the drive after dark, it was an unreal sight. There were people everywhere. Aline explains, “The community was there to support my family. I am very thankful for that now, but at the time it felt intrusive. I just wanted to be with my family.” The rest of the night has been erased from her memory. She knows she went in and hugged all her family, but doesn’t recall anything else after that like getting her kids, going home, or going to bed. 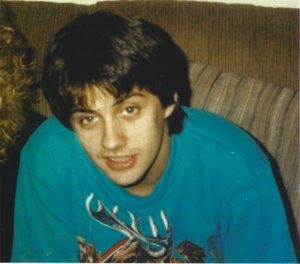 To her, the 25th anniversary brings the realization that Chris has been gone longer than he got to live. “That makes me sad, ” she says, “and it makes me a little bit angry that he didn’t get the chance to live a long life.” Chris missed out on so much. Shortly after his death, he received his five year anniversary award from Fast Food Mercandising. He never got to have the family he had dreamed of having although Aline says she can see him in both of her grandchildren, as bittersweet as that is. Even his long-time cat, Smokey was impacted. Aline says Smokey left home when Chris was killed and was never seen again. Her mom used to say that Smokey wandered off to die. Aline remembers Chris for his laughter and his kindness. She never realized how much Chris looked up to her until he was gone. Her last memory of him was somewhere around his birthday. She had driven to Jamestown to visit family, but Chris had not been there. As they were leaving town, they drove past Chris’ house and he was outside. They stopped to talk to him. He was upset about the death of a classmate who had drowned, explaining, “But he was a really good swimmer!” Aline had told him that things can happen so suddenly. Then she asked him to please be careful on the lake. “We never even got out of the car,” she remembers. Chris’ legacy lives on in the dedication of his sister, Aline. She shares his story at Victim Impact Panels to help offenders realize the devastating and life-long impact of the choice to drink and drive. And she has been a friend to many who faced the same terrifying consequences as her family. Chris may no longer be with us in body, but his giving and selfless spirit lives on in those who remember him.